This article updates and expands one I wrote on this subject for LewRockwell.com posted on March 8, 2018, and again on July 20, 2018. I presented it at the 36th Annual Meeting of Doctors for Disaster Preparedness in Las Vegas last week. Some of the slides I used for that talk are reproduced here. When WW II ended with two atom bombs dropped on Japan the United States emerged a superpower. When the Soviet Union collapsed in 1991, and with Russia struggling, the U.S. became the world’s sole superpower, militarily supreme. The U.S. military has sustained its post-war global dominance with 800 military bases and installations in 150 countries encircling the globe. Russia has only 14 military bases outside its current borders, with 11 of them in the former Soviet Republics. The U.S. military has 1,300,000 servicemen and women on active duty. Some 200,000 are stationed in bases in other countries (with 49,000 still in Japan, 39,000 in Germany, and 28,000 in South Korea). Russia has 1 million active duty personnel. The carrier-centric United States Navy currently has 11 aircraft carriers–10 Nimitz class supercarriers that cost $6 Billion each and one Gerald Ford-class supercarrier, which cost $13 Billion. (Two more Ford-class carriers are under construction. Two are on order and 10 more planned.) Russia has one aircraft carrier. The U.S. Navy has 71 submarines, about the same as Russia. Fourteen are Ohio-class ballistic nuclear missile submarines. In the DoD’s view, low-yield nukes should be in its “military toolbox,” along with conventional weapons. A month later, on March 1, 2018, President Vladimir Putin gave his annual State of the Nation speech to the Russian Federal Assembly in Moscow. The last third of his 2-hour, 13,340-word speech dealt with nuclear treaties and nuclear weapons. 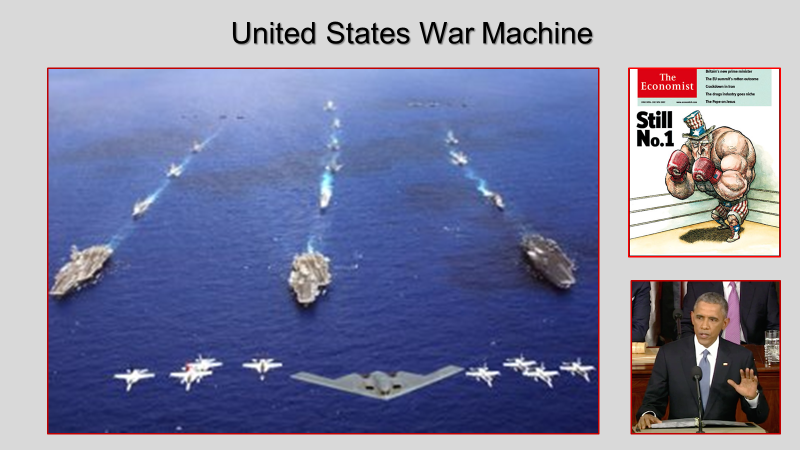 The weapon systems President Putin unveiled in his March 1 speech, if real, checkmate U.S. military global supremacy. Putin first showed a video simulation of Russia’s new RS-28 Sarmat heavy Intercontinental Ballistic Missile, from launch to release of the missile’s nuclear warheads over the target area. A mininuclear reactor powers this 120-feet long, 220-ton ballistic missile. It can place a 10-ton payload in near earth orbit. Information on its miniaturized nuclear reactor is classified. The capsule containing the nuclear warheads orbits around the south pole, thus being able to release them on American targets from the south side of the country, bypassing its missile defense system pointed north to intercept ICBMs coming straight from Russia over the north pole. The Sarmat’s reentry vehicles/warheads, flying suborbital, maneuver and plunge suddenly towards their target. The video of the Sarmat ICBM ends showing its nuclear warheads released and pointed at Florida. 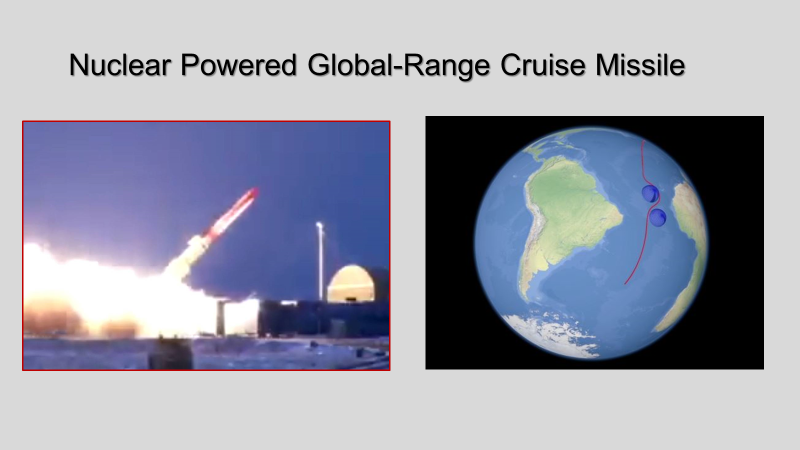 This new generation of thermonuclear warheads are both multiple independently targetable reentry vehicles (MIRV) and maneuverable reentry vehicles (MARV). The Sarmat ICBM carries ten 750-kiloton nuclear warheads, 7.5 megatons, enough destructive power precisely dispersed to wipe out the state of Florida. Russia already has placed several of these nuclear-powered ICBMs in silos and reportedly plans to deploy 50 of them by 2020, according to the American think tank Center for Strategic and International Studies. It’s quite a gas station that can make something like this. 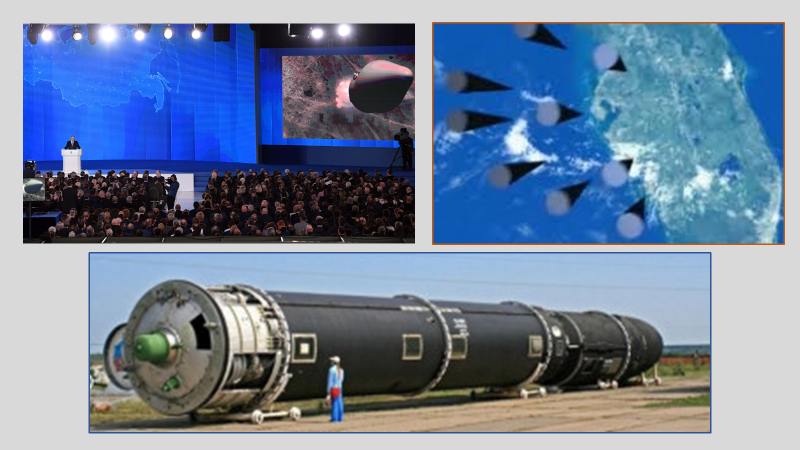 The next weapon President Putin unveiled is the Kinzhal Hypersonic Missile. A high-altitude aircraft like this MIG-31BM launches it at 60,000 feet. This missile is 26 ft. long, can accelerate to a speed of Mach 10 (7,500 mph), and executes evasive maneuvers along its flight trajectory. 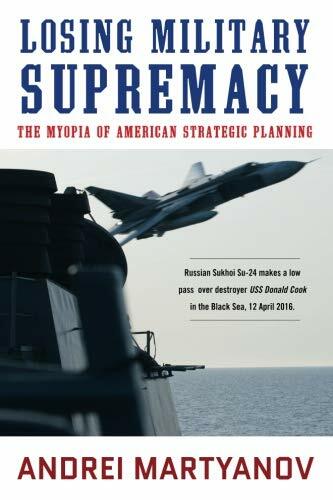 Losing Military Suprem... Andrei Martyanov Best Price: $16.00 Buy New $19.19 (as of 08:55 EDT - Details) As Putin put it, “This enables the missile to penetrate through all existing and projected air defense systems and deliver a nuclear or conventional warhead over a distance in excess of 2,000 kilometers”—1,200 miles. This missile is said to have passed its firing trials and been placed “on duty” in Russia’s Southern Military District, covering the Black Sea and Crimea. The Kinzhal missile’s speed alone makes it immune to all current air defenses. 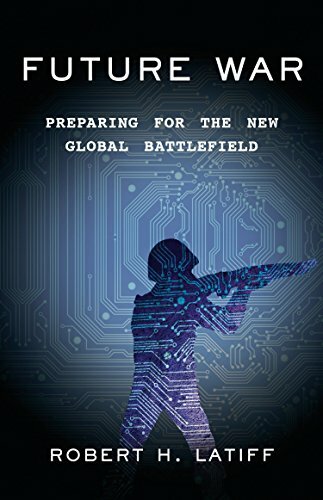 As military analyst, Andrei Martyanov, states: “This is a complete game changer geopolitically, strategically, operationally, tactically, and psychologically.” Martyanov’s book, Losing Military Supremacy: the Myopia of American Strategic Planning, published two months ago, is well worth reading. This “Dagger” missile (Kinzhal is the Russian word for dagger) made its public debut at Russia’s May 9, 2018 Victory Day Parade in Moscow. 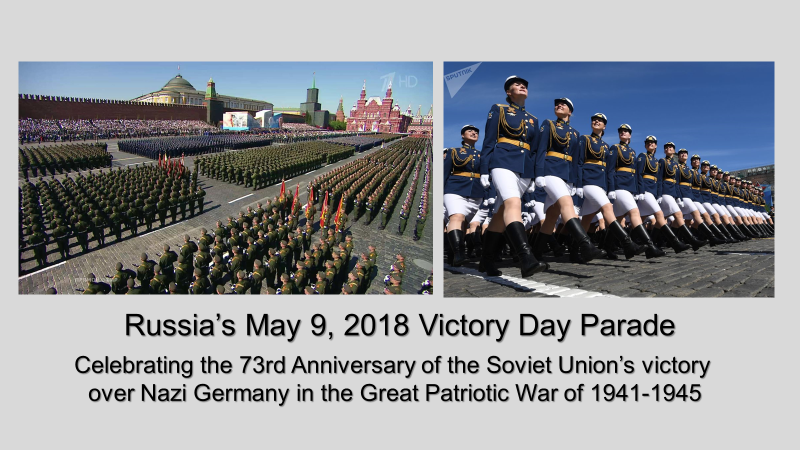 More than 13,000 servicemen and women participated in this year’s Russian Victory Day Parade. It included tons of military hardware, including a new unmanned robot tank. And a contingent of women troops. In World War II, Russia and its Soviet Republics suffered 27 million military and civilian deaths, in a population of less than 200 million. The United States bore 420,000 deaths. For each American who died in that war, 64 Russians perished. Supersonic speed is Mach 1.2 to 5; hypersonic speed, greater than Mach 5. 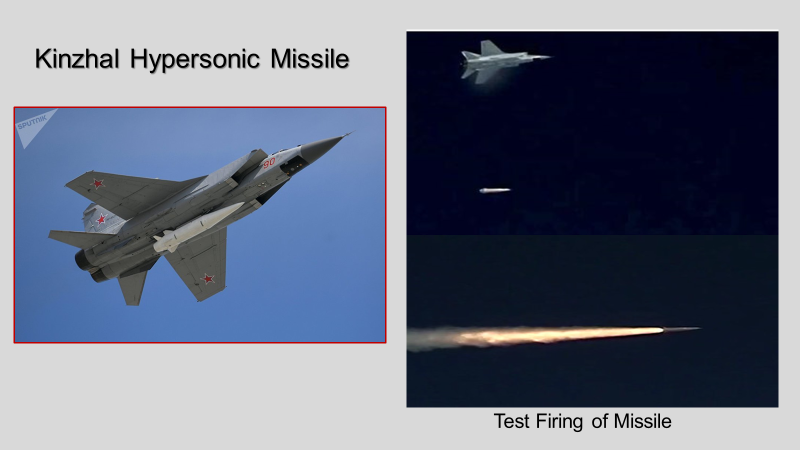 There are two basic types of hypersonic weapons: hypersonic cruise missiles that are capable of sustained, powered, and maneuvering hypersonic flight and hypersonic glide vehicles that can fly above 100,000 feet. Engine operations, pressure, and temperature constraints limit flight altitudes of hypersonic cruise missiles to 70,000 to 100,000 feet. 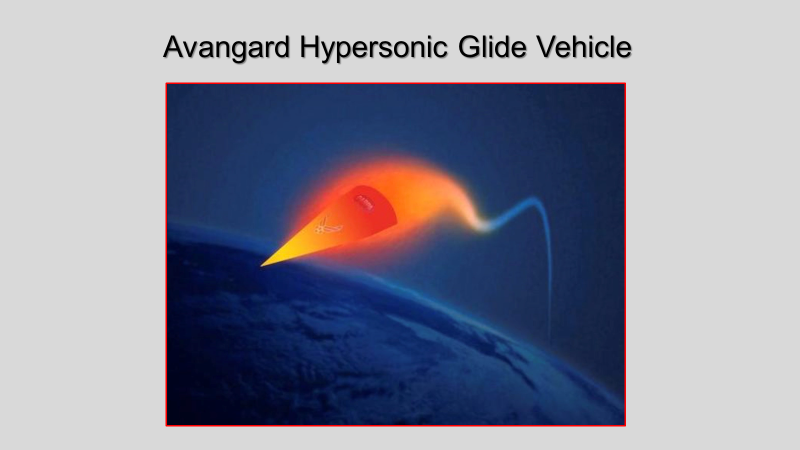 Another new weapon that President Putin unveiled in his speech is the Avangard Hypersonic Glide Vehicle. The RS-28 Sarmat ICBM launches it. This glide vehicle flies, in the atmosphere, at Mach 20—15,000 mph. President Putin described it this way: “It flies to its target like a meteorite, like a ball of fire. The temperature on its surface reaches 1,600-2,000 degrees Celsius [3,600 degrees Fahrenheit] but the cruise bloc nevertheless stays reliably guided.” The temperature on the surface of the sun is 10,800 degrees Fahrenheit, just 3-times hotter than on the glide vehicle. At Mach 20 the Avangard Glide Vehicle flies 8 times faster than a bullet fired from an AR-15 rifle, the Avangard at 4 miles per second and the .223 bullet at half-a-mile per second. 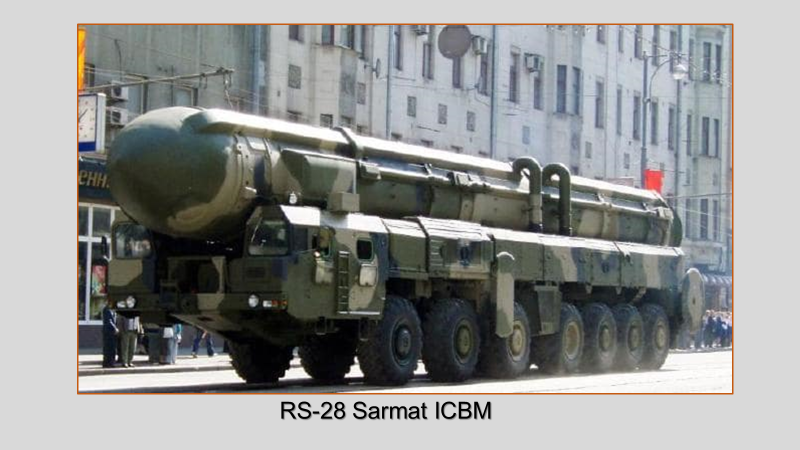 The RS-28 Sarmat holds 16 hypersonic glide vehicles, each one containing a 500-kiloton nuclear warhead. President Putin also unveiled a nuclear-powered, precision-guided cruise missile that he claims can fly indefinitely and deliver a nuclear or conventional warhead to any point on the earth’s surface, including anywhere in the United States. His animated video of it showed a low-flying, terrain-hugging missile closely clearing mountain peaks and then on around the world evading missile defenses. This ground-launched missile remains in the testing phase. 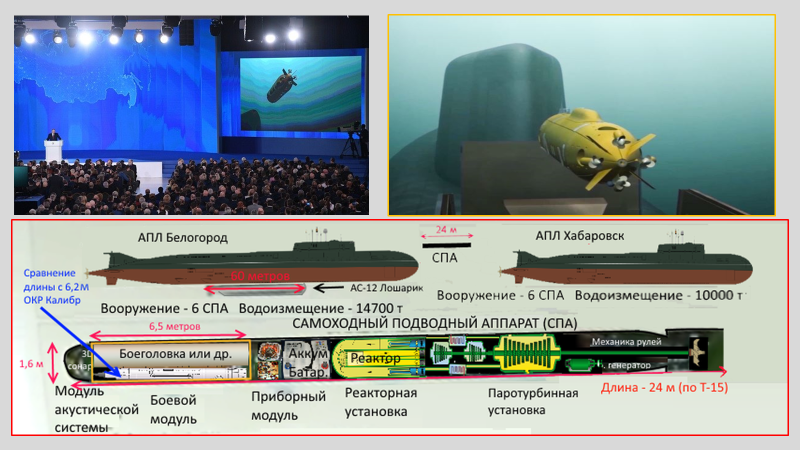 President Putin showed a computer-generated image of Russia’s new unmanned, fast-moving underwater nuclear drone. This weapon has a 5,000-mile range, can travel at 56 to 80 knots (65 to 92 mph) and can descend to a depth of 3,000 feet. America’s DefenseNews confirms that it is real. And the U.S. Nuclear Posture Review also confirms this drone’s existence, calling it a Status 6 AUV, for autonomous underwater vehicle. The illustrative blueprint above shows the drone to be 79 feet long and 5 feet in diameter. The mininuclear reactor that powers it is 100 times smaller than the nuclear reactors that power submarines. It carries a thermonuclear warhead variously reported to be 2, 50, or 100 megatons, containing cobalt-59 that releases high amounts of radioactive fallout when converted to cobalt-60 in the blast. Detonated underwater next to the coasts of North America, it will create a radioactive tsunami wave 300 to 1,500 feet tall that will wash over and destroy coastal cities like New York and Los Angeles. View as a bullet, laser beams fly at the speed of light. The elusive megawatt combat laser needs two things: good beam quality and good SWAP—for size, weight, and power. A miniaturized nuclear reactor, which Russian scientists and engineers have designed and built for its Sarmat ICBM, new nuclear-powered cruise missile, and underwater nuclear drone solves the SWAP part of the equation, particularly for a megawatt combat laser. A mininuclear reactor is most likely in the front part of the truck powering the laser. Putin invited Russians to submit names for the three yet unnamed weapons on a web portal set up for that purpose. For the underwater drone, Russians chose “Poseidon,” after the Greek god of the sea. For the nuclear-powered cruise missile, they chose “Burevestnik,” the Russian name for the Storm Petrel seabird, whose presence mariners believe foretells bad weather. 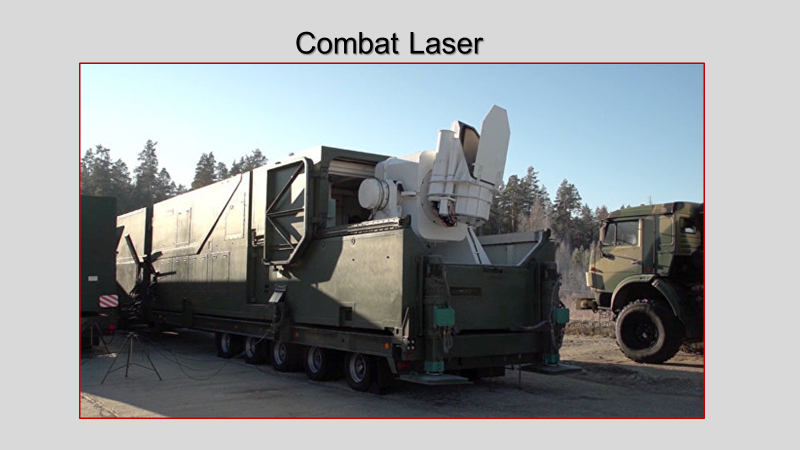 And for the combat laser, “Peresvet,” after the medieval warrior monk, Alexander Peresvet, who died taking part in a 14th century battle against invading Mongols. The U.S. military has no such weapons—no hypersonic missiles or glide vehicles, no nuclear-powered cruise missiles or underwater drones, and no megawatt combat lasers. On March 20 General John Hyten, Commander of the U.S. Strategic Command, reported to the U.S. Senate Committee on Armed Services: “We don’t have any defense that could deny the employment of such weapons against us…” He is referring here to hypersonic weapons. What if the next time the U.S. military fires Tomahawk missiles at targets in Syria, or Iran, Russia responds by not only shooting down the missiles but, as it has threatened to do, also destroys their source of origin. A Kinzhal hypersonic missile armed with a conventional weapon strikes and sinks the aircraft carrier from which the missile-carrying planes took off. Would America really respond to the sinking of one of its aircraft carriers by starting a first-strike nuclear war? Aircraft carriers are sitting ducks. They are defenseless against hypersonic weapons. Attacking and sinking a U.S. carrier with a hypersonic missile anywhere on the planet gives Russia what analysts call escalation dominance, which the United States cannot counter in kind. 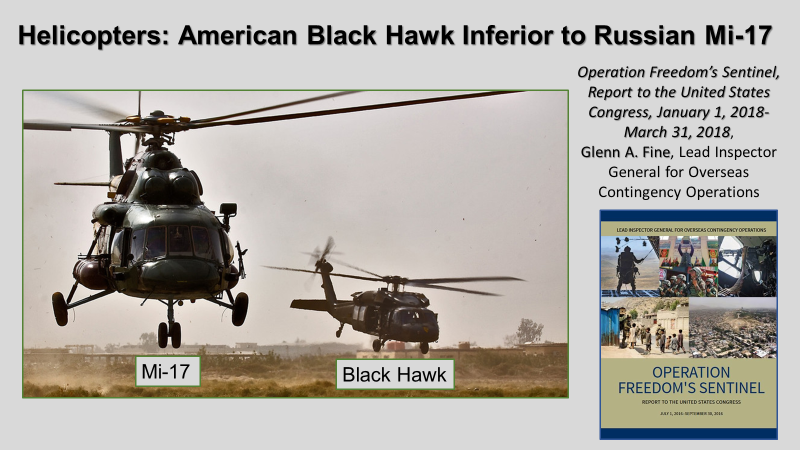 There aren’t any Russian targets with an actual and symbolic value like a U.S. aircraft carrier with its 85 jet fighters and 3,000 crew members. 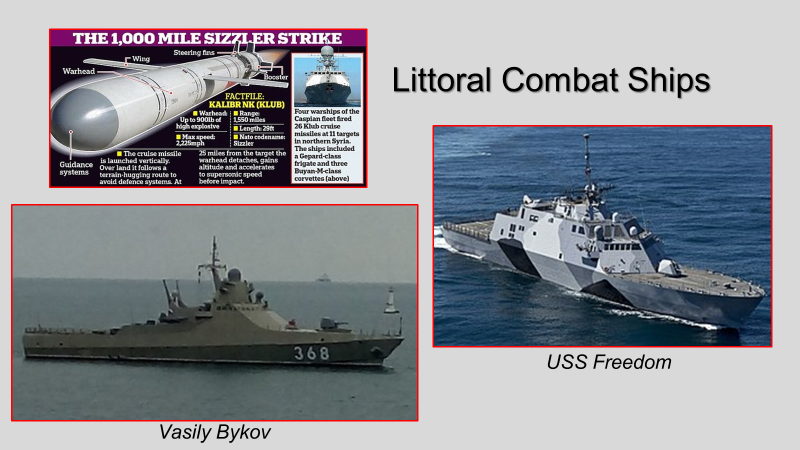 The United States trails Russia in a variety of other weapon systems—among them 5th generation jet fighters, littoral combat ships (“littoral” meaning close to shore), ballistic missile submarines, mobile anti-aircraft systems, and helicopters. 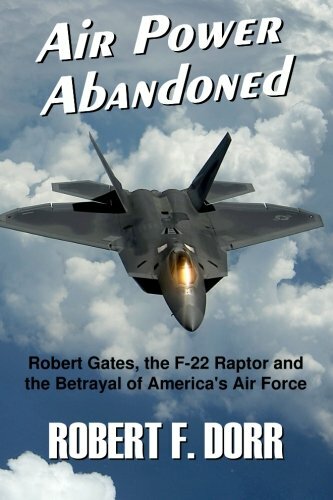 The DoD awarded Lockheed Martin a contract in 2001 to build a 5th generation jet fighter that would fulfill the requirements not only for the Air Force, but also for the Navy, flying them on and off carriers, and for the Marines with their being able to provide close air battlefield support. The Marine Corps insisted that the new F-35 Joint Strike Fighter have Vertical Take-off and Landing capability, VTOL, like a helicopter. This requirement to provide space for a VTOL lift fan, effectively spoilt the airframe for the F-35. 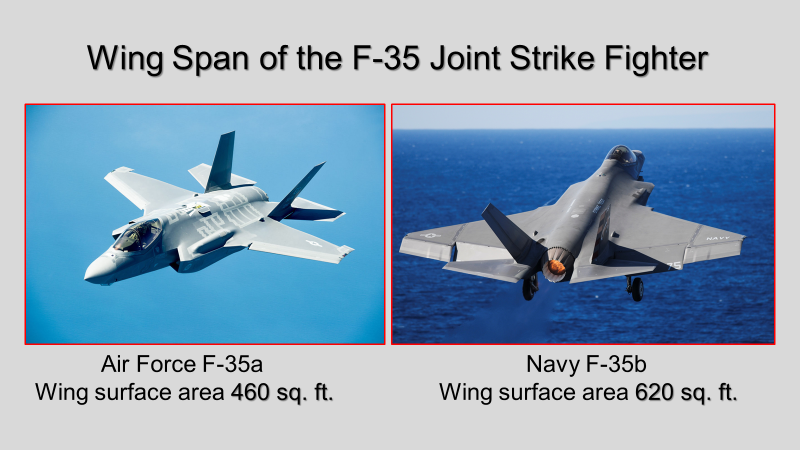 The F-35a for the Air Force 35a has a wingspan of 35 feet and a wing surface area of 460 sq. ft., not enough wing area for it to be able to fly low and slow. The F-35b for the Navy has a larger 43-foot wingspan with a wing area of 620 sq. ft. making it able fly slow enough to remain airborne and land safely on an aircraft carrier—and not fall into the ocean on takeoff. The F-35 is turning out to be second-rate combat aircraft, less able to perform its mission than the legacy F-16 it is designed to replace. Although not widely reported in the U.S. media (see here), in a staged dogfight the F-35 proved no match against the 40-yo F-16. Lockheed Martin in California runs the F-35 program along with 1,400 subcontractors distributed throughout 46 states, shoring up congressional support for the project. The economic impact of the F-35 program has, so far, topped $100 Million in 18 states, led by Texas ($6.2 Billion), California ($5.1 Billion), and Florida ($1.4 Billion). The only states with no economic sway in this program are Alaska, Hawaii, Wyoming, and Nebraska. The DoD originally planned to buy 2,400 F-35s. The program is a decade behind schedule, and so far, only about 300 of them have been sold. Their cost continues to rise, now, some say, topping $200 million dollars per plane (depending on how many can be sold). The helmet alone for the pilot costs $600,000. Nevertheless, the Pentagon, with congressional support, has declared the F-35 program “too big to fail.” This is what one could call “collective corruption”. 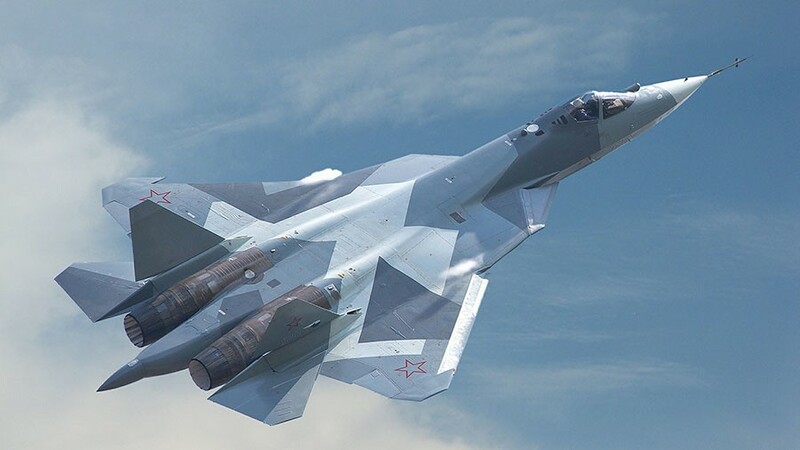 The “gas station masquerading as a country” has built a highly acclaimed 5th Generation jet fighter, the SU-57. In contrast to the F-35 Joint Strike Fighter, it has a broad, aesthetically appealing wingspan. 4-Sensor Fusion, highly integrated computer systems capable of networking with other elements to provide all-round situational awareness. The F-35 Joint Strike fight is not, as advertised, a 5th Generation jet fighter because it cannot maintain supersonic flight without afterburners. It can only fly up to Mach 1.2 for 150 miles without them. Multi-role littoral combat ships is another area where Russia has achieved a technological advantage. The Kalibr-NK missile has a 1,500-mile range and proved its worth when Russia fired it from ships in the Caspian Sea against terrorist targets in Syria 900 miles away. The missile comes armed with either conventional or nuclear warheads. This Russian corvette has an arsenal ranging from surface to air interceptors to an inflatable boat that a commando team can use to liberate civilian hostages in a vessel held by pirates. One respected military correspondent writes that this corvette has “a pretty genius design” with a small frame providing great strike power. In contrast, USS Freedom, one of the newest class of American Littoral Combat Ships, has had trouble passing inspections. According to a Government Accounting Office (GAO) report, those ships have taken longer to build, cost more, and delivered less than expected. Inspection tests show problems with the fire-fighting and electrical systems, along with generator meltdowns, computer systems failures, and burst pipes. The United States also lags Russia in nuclear-powered ballistic missile submarines. The U.S. fleet has 14 of them, all Ohio class. The first one, the USS Ohio, is now 37 years old and is still in active service. The youngest one, the USS Louisiana, has been in service for 20 years. 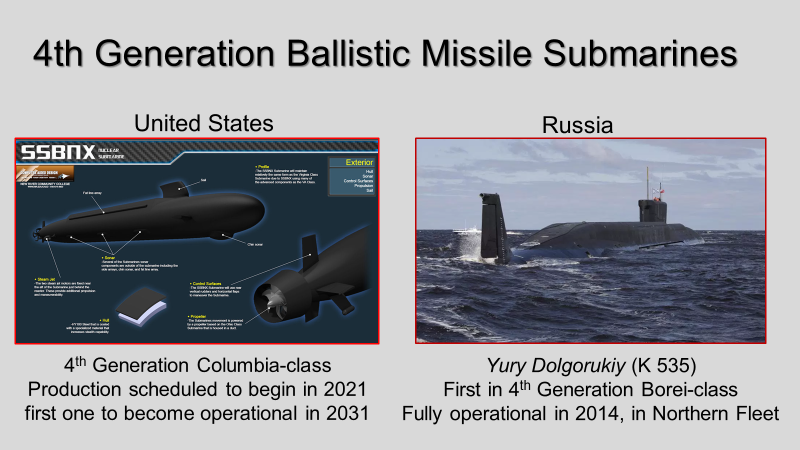 The DoD plans to replace them with 12 Columbia-class 4th generation electrically run, quiet ballistic missile submarines. Production is scheduled to begin in 2021, with the first one becoming operational in 2031. Russia has already launched 3 of its Borei-class 4th generation ballistic missile submarines, and five more are under construction. The first one is fully operational and joined Russia’s Northern Fleet in 2014. The U.S. Columbia-class submarines are presently estimated to cost $10 B dollars each. But its cost will certainly go up following the discovery earlier this month of faulty welding in the missile tubes destined for this project. 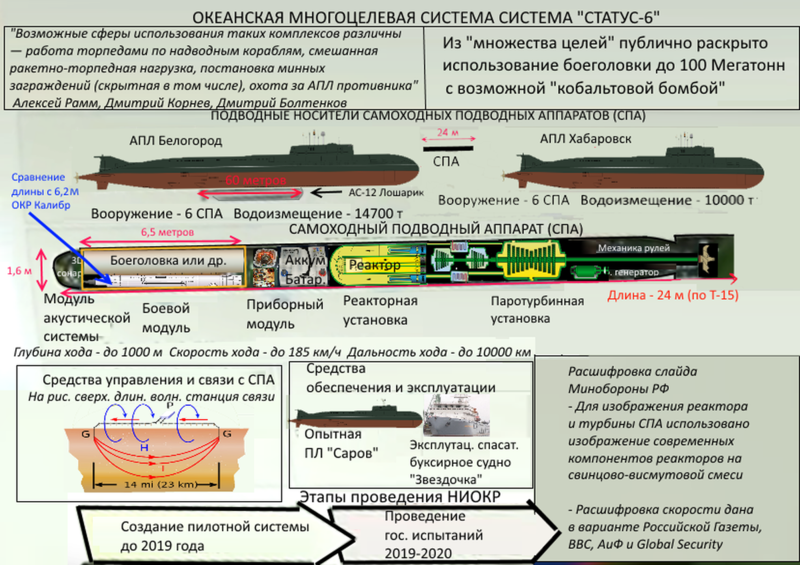 The same-generation, same-size Russian Borei-class ballistic missile submarines cost $1 B dollars each. The Russian S-400 Triumf multifunctional anti-aircraft system is designed to destroy aircraft, cruise and ballistic missiles, and ground objectives up to 240 miles away. China was the first country after Russia to purchase and obtain the S-400 Triumf, which comes with a multifunction radar complex that can track aircraft employing stealth technology, like with the F-35. 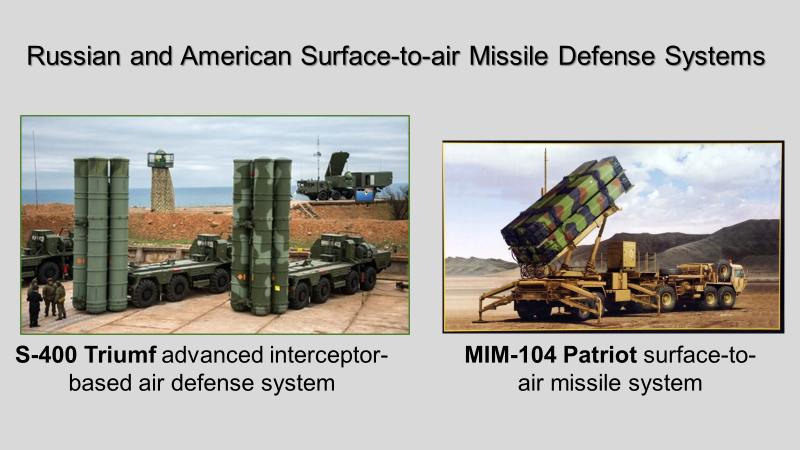 Turkey, India, and Saudi Arabia also want to purchase the S-400 instead of the American Patriot system. Military analysts say it is an open secret that the S-400 is much more capable than the American Patriot air-defense system. The U.S.A. was a pioneer in nuclear power. 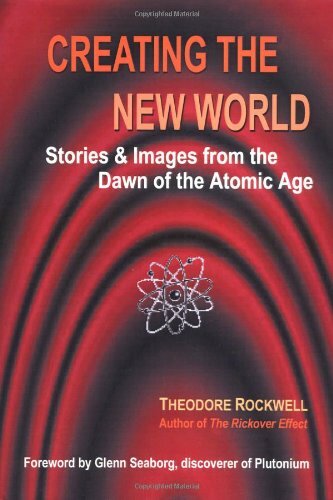 Ted Rockwell, who played an important role in its development, describes the dawn of the atomic age in a most engaging fashion in his book Creating the New World: Stories & Images from the Dawn of the Atomic Age. In 1951, an experimental breeder reactor in Arco, Idaho was the first reactor to generate significant amounts of electrical power. Then Admiral Rickover and his team built and launched the first nuclear-powered submarine, the USS Nautilus, in 1954. The first commercial electric-generating plant powered by nuclear energy came online in Shippingport, Pennsylvania, in 1958. Of 96 civil nuclear power plants built in the U.S., 35 have closed, and no new ones have been ordered since 1974. The 61 plants still operating in 30 states house 99 nuclear reactors that provide 20% of the nation’s electricity. The first new nuclear reactor to be built in a long time was at a plant in Tennessee in 2016. 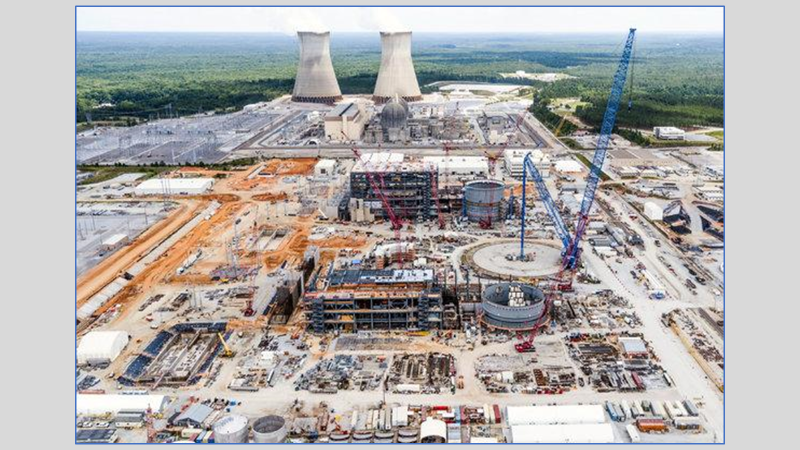 Two reactors under construction at a plant in South Carolina were recently cancelled, half-way completed, when Westinghouse filed for bankruptcy. But two other nuclear reactors remain under construction in Georgia at its Vogtle plant, shown here. They are scheduled to come online in 2022 and 2023. Myriad regulations and environmental strictures wedded to the linear no threshold view of radiation make building new nuclear power plants in the U.S. virtually impossible—and threaten completion of the 2 new nuclear reactors under construction in Georgia. Russia now has 37 nuclear reactors with 5 more under construction and 20 more planned. And Russia is also building 34 new nuclear reactors in 12 countries, China, Iran, and India among them. In addition to miniature nuclear reactors powering various weapon systems, Russian scientists have become leaders in fast neutron technology for nuclear reactors. 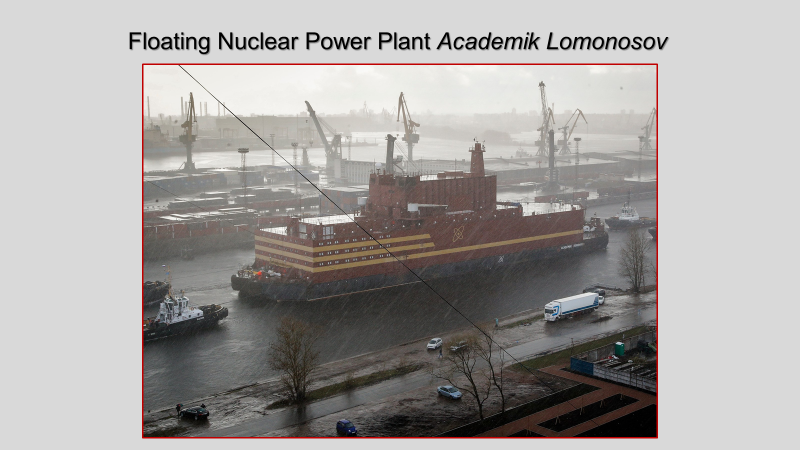 And Russia is also building floating nuclear power plants. The first one is the Academik Lomonosov. It has 2 nuclear reactors that produce 35 megawatts of electricity and 150 megawatts of heat. It can also desalinate ocean salt water and turn it into drinkable water. Towed through the Baltic Sea to Murmansk for fuel loading, it is going to provide power to the arctic town of Pevek. Its reactors are modified Soviet KLT-40 naval propulsion reactors made for their nuclear-powered icebreakers. Designed to be mass produced, Russia plans to buy 7 of them, and so far, 15 other countries are interested in acquiring one. At the Doctors for Disaster Preparedness meeting in 2005, the late Sol Penner, Professor of Jet Propulsion at Caltech and then founding chair of the San Diego Center for Energy Research at UCSD presented facts that support the prediction that humans will use predominately nuclear energy in the future. Art Robinson, in the April issue of his Access to Energy newsletter, points out that in future years Russia, China, and India will possess most of the world’s nuclear power and will thereby also have most of the of the world’s heavy industry, for whom energy is a major expense. With American energy costing three to six times more than Asian energy the contest for heavy industry will be over. The U.S. will be on the road to becoming a third world country. In addition to lagging behind Russia in hypersonic weapons and nuclear technology, our military is also saddled with problematic, inferior, and obsolete weapon systems like the F-35, aircraft carriers, ballistic missile submarines, and helicopters. It makes little sense for Washington to spend $200 Billion tax dollars on 14 new Ford-class aircraft carriers when hypersonic weapons have rendered them obsolete and turned aircraft carriers into floating death traps. Vladimir Putin’s speech on March 1, 2018 publicly ended U.S. military supremacy. The United States is no longer the world’s technologically superior superpower. Russia is. As happened with Sputnik in the Cold War Space Race, our country is now in a Cold War 2.0, this time in a Hypersonic Weapons Race. Once again, the U.S. finds itself behind Russia, and China, in this race. After Putin’s speech Congress awarded Lockheed Martin $1 Billion to design and produce an American hypersonic missile. Then three weeks ago, Congress gave this weapons manufacturer another $500 Million, with a promise of more to come for hypersonic weapons. This Cold War carries a heightened risk for turning into a nuclear war, with Washington’s neoconservatives and neoliberal interventionists demonizing Putin, pushing war, and thinking the U.S. can get away with using tactical nuclear weapons in regional conflicts. This 21st century Cold War has already triggered an economic war when the United States started imposing sanctions against Russia in 2014. Nuclear War Survival S... Cresson H.(Author) Kea... Best Price: $7.50 Buy New $15.00 (as of 12:40 EDT - Details) Invaded by Sweden under King Charles in the 18th century, by France under Napoleon in the 19th, and invaded by the Nazis under Hitler in the 20th century, it is fair to say the Russian people and their President want peace. But what if something happens to Putin and a hardline military general, like a Dr. Strangelove, becomes President of Russia and takes control of its nuclear arsenal? Or terrorists get ahold of nukes? 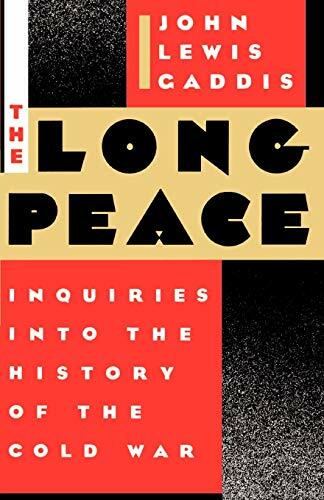 And by not objecting to the use of battlefield tactical nuclear weapons, America’s neoconservatives and neoliberal interventionists seem to have shoved the adage, “A nuclear war cannot be unleashed, because there will be no winners” down the memory hole. 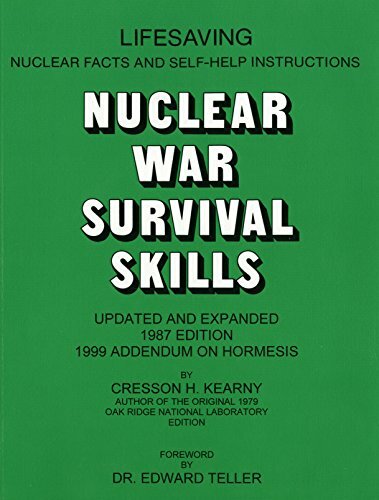 It behooves us to once again heed Cresson Kearny and read his book Nuclear War Survival Skills (1987 Revised Edition, with 2001 Addendum on Hormesis), and hone our nuclear war survival skills. Disaster preparedness for nuclear war is now more important than ever.